Sterling silver Dresser sets — Harriete Estel Berman Sterling silver Dresser Sets restored, repaired and polished. Sterling silver dresser sets can be repaired, restored and polished. At one time a dresser set would be de rigueur for every ladies dressing table. They came in both sterling silver and silverplate manufactured for every price range. Now they are all 60 to over 150 years old with dents and wear. Repair and restoration of silver dresser sets can be a Pandora's Box of problems. Learn more about restoring dresser sets. Replacing the comb in a sterling silver fitter is a relatively easy restoration but it takes time. 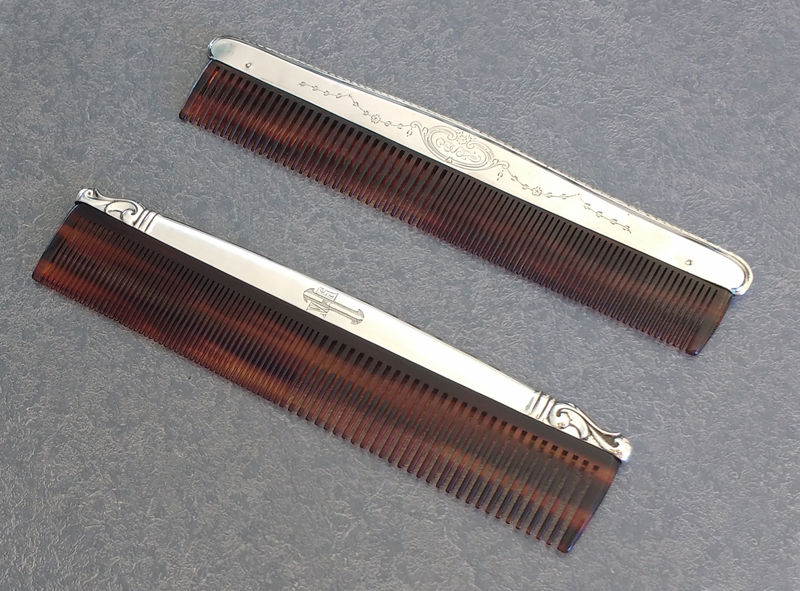 The new plastic combs are available in a tortoiseshell colored plastic in a variety of sizes but must be custom fit to the sterling silver fitter for optimal fit. Since each sterling silver comb fitter is different this takes time and patience but the results look great. If the sterling silver comb holder is splitting along the seam it can be repaired with silver solder. Please don't wait till it comes apart into two pieces. Repairing a split in the seam is much easier that trying to put two halves back together. If the plastic comb is broken or missing treat the comb fitter very gently protecting it from damage. The silver is very thin and fragile. Gold Comb fitter with comb replaced and Sterling Silver Comb Fitter repaired. 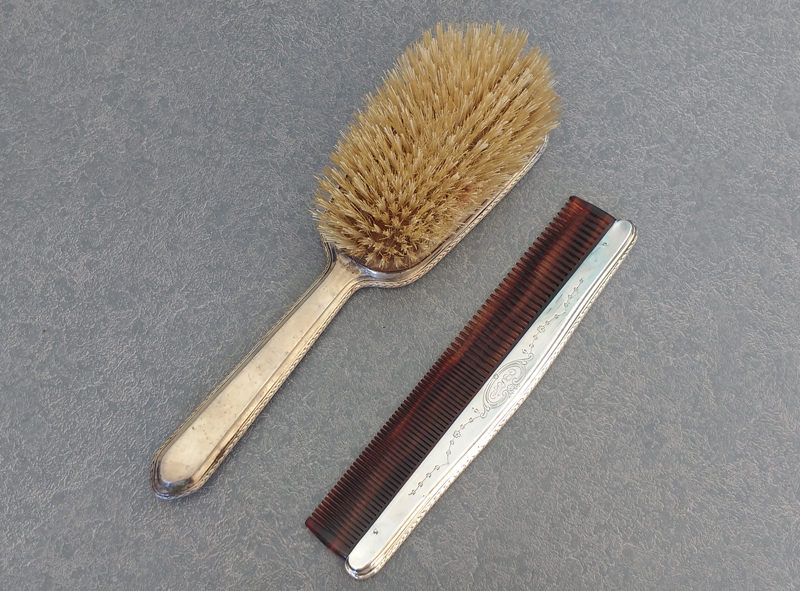 The gold comb fitter is very unusual (top comb above photo.) In this example the comb was replaced. The sterling silver comb fitter required extensive repair (lower comb above photo.) It arrived with extremely large rivet holes and reduced width from a poorly done repair. I closed down the holes to a more standard size by soldering in sterling silver tubing and then replaced the comb. Click here to vie more sterling silver comb repair issues, and the wide variety of sterling silver combs. Dresser sets often had decorative glass jars with sterling lids. Often referred to as powder jars they came in all shapes and sizes in a wide variety of patterns. The lids are often dented, creased, crushed suffering a hard life. Generally, all the dents can be removed with great skill and patience. The dents need to be carefully pushed out from the inside and burnished on the outside. Click here to see each of these lids more closely. I was able to restore these lids to close to perfection and preserve the gold plating on the inside. New brushes for sterling silver fitters are custom made for the sterling silver brush fitter. This may take several weeks to months and an investment into $100's of dollars. If the brush is in good condition and does not need to be replaced, I can polish the sterling fitter, and leave the brush "as is" to save you a lot of money. Restoration of dresser set accessories like button hooks, cuticle knives and files are extremely limited. In this situation the client provided extra parts from orphan pieces (upper left group) so that that these three pieces (center) could be restored best possible. In the photo below, the file and button hook were very rusty. I polished the steel file and steel button hook aggressively to remove the rust best possible to keep the orginal parts. The sterling silver handles were carefully polished. 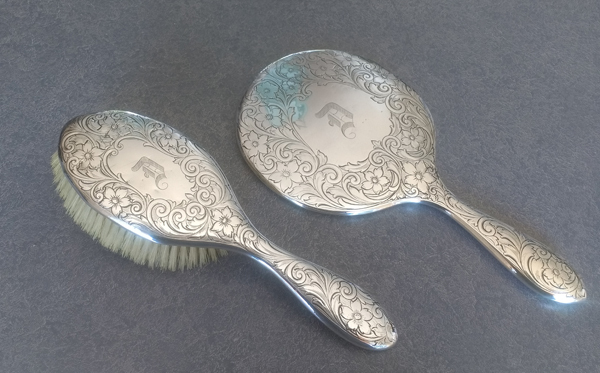 Sterling silver hand mirrors present unique issues. Polishing the sterling silver mirror holder is not a problem. Great care is taken to polish only the sterling silver hand mirror frame lightly to preserve the pattern and details. 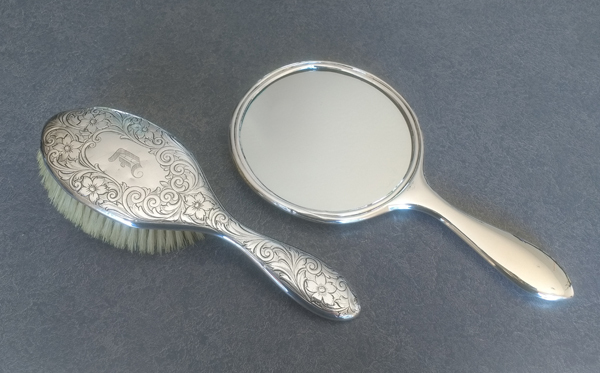 The sterling silver hand mirror shown above was dented and damaged, but the critical issue was that the mirror it came with did not fit properly. In the examples above, I did the minimum amount to restore this hand mirror. A new plain glass mirror was cut to the correct size, and the dents were pushed out so the bezel would fit properly. Then the brush and mirror were carefully polished. Originally, all of theses sterling silver hand mirrors had a beveled glass mirror. If possible it is best to reuse the old mirror. Old mirrors always look much better (in my opinion.) The old mirror can be removed from the sterling silver hand mirror, and resilvered with all the ghosts, imperfections and character of time. This is my recommendation. If the glass is broken a new mirror is the only option. A new plain glass mirror costs significantly less than a new beveled glass. A new beveled glass mirror is all hand work. There is no such thing as ready made replacement parts. There are three types of bezels holding the mirrors in the frame. The mirror has to fit exactly right. I mean exactly, exactly, exactly. If the mirror is broken save the pieces. It can be used as a pattern for the new mirror. The mirror bezels are very thin with an edge that fits right under the front edge of the sterling silver frame. Taking it in and out is super tricky. Do not do this yourself. If the bezel is kinked, it doesn't fit correctly. 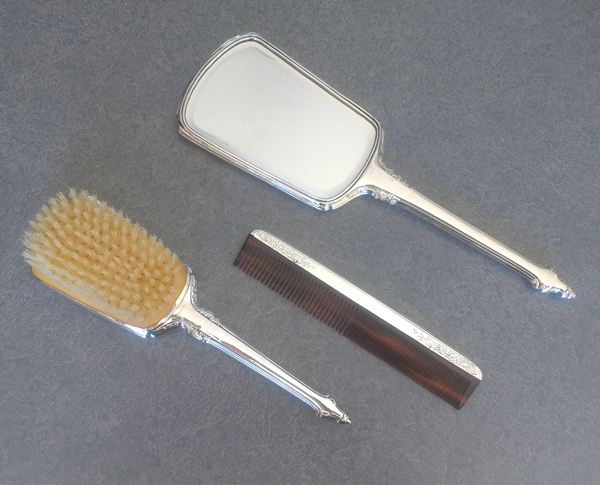 Contact me any time about your sterling silver mirrors, brushes, or combs.